作者: Hiren-Phukan on 1 June , 2015. A minority community in Myanmar, targeted for institutionalised persecution for decades, is facing the threat of coming under more mob-led atrocities, torched, segregated and starved out of existence. This is how fact-finding Asean legislators, regional and international rights activists, reporters and others who have been to Myanmar sum up the Rohingya crisis. The exodus of thousands of the persecuted has tragically been in “floating coffins” —ramshackle boats into which traffickers enticed Rohingyas with the prospect of asylum and jobs in Malaysia, Thailand, Indonesia and elsewhere. The persecuted, hounded from their homes by lynch mobs, and stripped by the authorities of even everyday rights — to move around, work, get married, send children to school, receive medical treatment — fell easy prey to the traffickers, paying them and corrupt official collaborators by disposing of whatever they could. Between January and March this year, according to a United Nations estimate, 25,000 of the helpless left in the boats seeking refuge. There would have been many more with them but they perished on way to the boats in prison-like camps smugglers set up secretly on routes to the boats along Thailand’s border. Mass graves of the fleeingmigrants have been found, both within Thai frontiers and in Malaysia’s northern state of Perlis, bordering Thailand. In one grave alone up to 100 corpses were found. Discovery of some of the graves by Thai authorities led to a crackdown on smugglers. The result was they vanished, abandoning the refugee-choked boats adrift at sea with little food or water. An unknown number on board died, many fell ill, others resorted to drinking their own urine to survive. The Rohingya crisis, brought to world attention by the horrific sufferings on the boats, has been simmering for decades. Numbering 1.3 million people, most living in the Rakhine state in western Myanmar, the community has been facing unremitting human rights abuses and sectarian violence, all calculated to throw them out of the country because they are regarded as illegal immigrants, mainly from an adjoining region — Bengal as it was known when the British ruled India, and now Bangladesh. Mosque, one of Arakan’s largest mosques. Lately said to be a target of vandalism by Buddhist-led mobs, it was constructed in the 17th century. 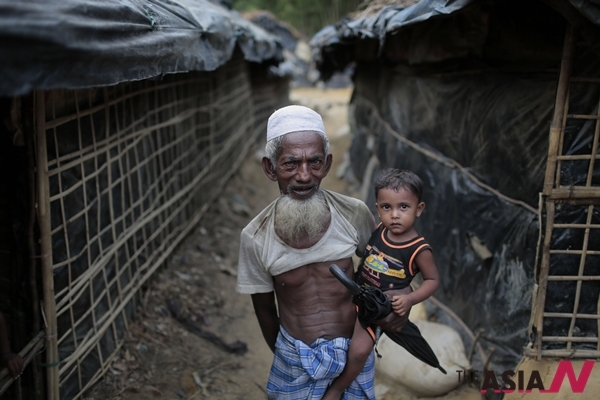 The Myanmar authorities have never acknowledged widely reported campaigns of violence against Rohingyas year after year, particularly since General Ne Win’s imposition of a dictatorship in 1962. The official response to the atrocity charges is that they do not tally with “ground reality” . A section of Buddhist monks which has emerged as instigators of violence since the military relaxed its stranglehold on the nation put the blame always on the Rohingyas, saying they are the provocateurs. 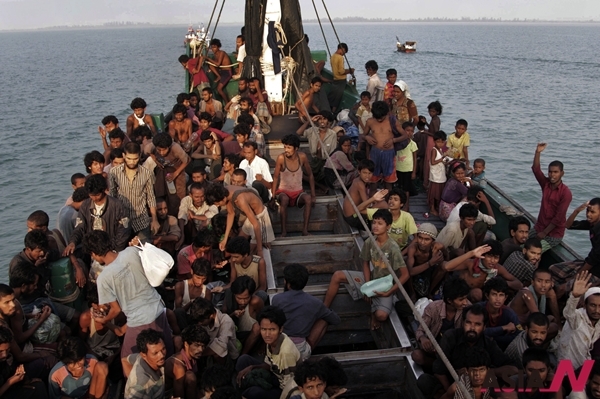 Starting with Gen Ne Win ‘s dictatorship, which enacted the infamous 1982 law delisting Rohingyas from the nation’s indigenous peoples, every Myanmar government — including not only his successor regime, the State Law and Order Restoration Council (SLORC), but also the present liberalising ruling power — has regarded Rohingyas as no more than wily, illegal immigrants from Bangladesh. As such they can have no rights at all, their habitat for all practical purposes now an apartheid hell. Once rendered homeless, the victims are segregated in squalid camps, packed over the past several months with hundreds of thousands of despairing people. The jam-packing of camps has heightened since a spurt in violence against the Rohingyas in 2012. The Asean Parliamentarians for Human Rights (APHR], an activist group of legislators and like-minded people from the region, said in a report in April this year after a fact-finding mission to Myanmar that some 150,000 Rohingya Muslims remain in more than 80 internal displacement camps in Rakhine state with limited access to humanitarian aid, while more than 100,000 others have fled by sea to other countries, often at the hands of abusive human traffickers, the criminals who by abandoning the latest batch of refugees at sea brought about the current catastrophe. 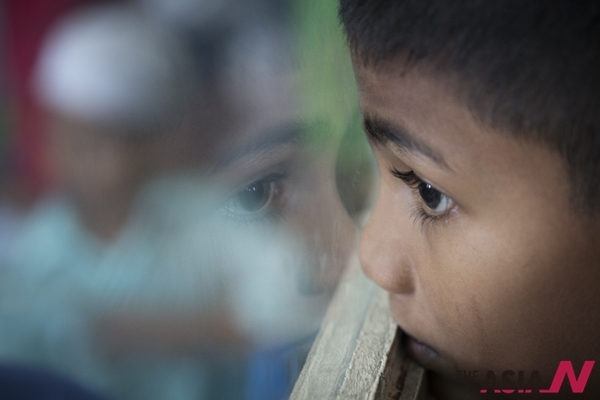 Over 100,000 Rohingyas who could escape are now living as refugees in Malaysia, and several hundred thousand are in Bangladesh, Thailand, and other Asean countries combined. At a discussion titled “The Slow-Burning Genocide of Rohingyas,” last November in Harvard University, Amartya Sen, winner of the 1998 Nobel Prize in Economic Sciences, cautioned that it was important not to toss around the word “genocide” lightly. According to the Harvard Gazette, Sen, who is the Thomas Lamont Professor said that though the Rohingya situation looked different from the murderous examples of Nazi Germany and 1994 Rwanda, the term applies in this case, with lives lost not just to the outbursts of violence, but also to the denial of healthcare and the right to work. He noted that campaigns since the Gen Ne Win’s 1982 law classifying the Rohingyas as immigrants have turned not just official policy against them, but also public opinion, something that would have to change for the situation to be remedied. “In order to win this battle, I think the support of the people is absolutely essential — who have been fed lies,” he said. Indeed, it’s lies and fear that are sweeping the country, fear forcing Rohingyas to seek to escape from Myanmar, and lies and fear spread among the Buddhist populace of alleged Muslim designs and crimes to destroy the Buddhist majority. The fear-mongers engineering anti-Muslim sentiment are ultranationalist Buddhist monks, whose leader has come to be known as Myanmar’s Bin Laden. His group wants Muslims to suffer an economic death, calling for boycotts of their businesses and putting “969” stickers and Buddhist flags to mark out Buddhist shops from Muslim ones. His defenders say he is against violence, his objective being to protect Buddhist identity. His sympathisers insist he is only reflecting the fears among ordinary Buddhists that they face the danger of being outnumbered by Muslims as they produce more children by being able to have many wives. 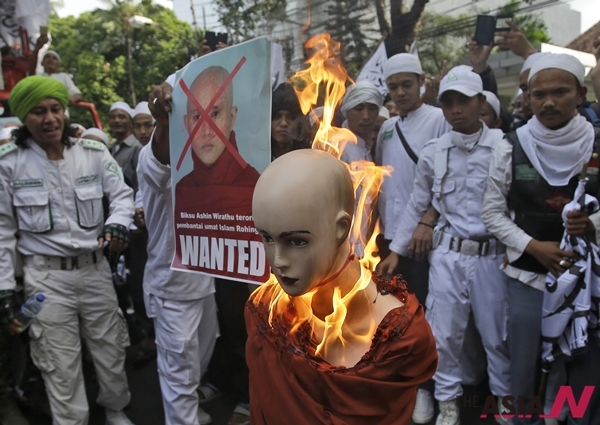 Wirathu, who was jailed in 2003 for inciting anti-Muslim riots but released in 2012 as part of a general amnesty, stokes those fears of a Muslim takeover, despite the fact that Myanmar is 90 percent Buddhist and 4 percent Muslim. by saying Muslims are growing fast through illegal immigration and forcible conversions. That hatred could be fomented so openly with no action against the fear-mongers may appear surprising but at a time when the country is slowly emerging from harsh military rule cross-currents prevail that help the instigators, playing a nationalism card and fuelling imaginary fears. The ultranationalist monks may be few jn number — Myanmar has half a million monks and nuns — but they have been persistent in whipping up fear by exploiting simmering ethnic and religious tensions in league with political groups, and the remnants of the military hardliners, according to one observer who has visited the country. Aung San Suu Kyi has herself stayed silent on the Rohingya issue, seemingly unmoved even after it drew attention across the entire world following the appearance of the boatloads of the desperate people off the shores of Malaysia, Indonesia and Thailand and these countries’ move initially to push them back far into the sea. With voices across the world crying out loud and clear in outrage against the push-back policy, thanks to the regional and international media’s projection of the fleeing people’s agony, a decision was taken to give shelter to them for up to a year. What happens after that is anybody’s guess. The only effective solution lies in a reversal of inhumanity by Myanmar, as urged by the Asean parliamentarian group and many others. Mere condemnations or even trade or other sanctions are unlikely to find a response in a country that has the experience of being forced by its military to stay as a hermit nation since the appearance of Gen Ne Win more than half a century ago. Now that the general populace is being fed more and more lies and fears about so-called illegal immigrants being a terminal risk to their future, it will be even more difficult to bring round the country to a path that can make it bond with the rest of the world by ending the dehumanisation of the Rohingyas. Tackle Yangon’s imaginary fears, or rather its hallucination, of the hapless community’ aims, and a solution could emerge. In the meanwhile, it is to be hoped the world will offer whatever aid is possible to the displaced, moving in a manner countries do to rush relief when a major earthquake strikes. Here is a catastrophe caused by savagery pinned to fears that only a generous degree of humanity can end.